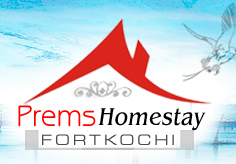 Prems home stay is located in the heritage zone, close to all the hot spots in Fort Cochin. Santa Cruz Basilica, Fort Kochi beach, Vasco Da Gamma Square, the Chinese Fishing nets, are all at walking distance from the home stay. The old Parade ground, and the cross roads around it, with the age old colonial buildings on either side, the Princess Street, one of the main joints of tourists, are all nearby. Walking through the streets will take you back to the French colonial era. Right from the colonial era, Fort Cochin is synonymous with the tradition of providing warm hospitality to both domestic and foreign visitors. The French, the British, the Portuguese and the Dutch who visited this wonderful land, always had a warm welcome. 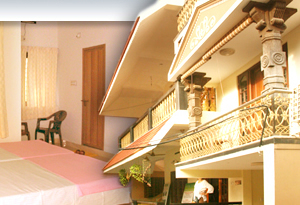 It is this tradition that still prevails, when it comes to providing cozy, affordable accommodation to tourists visiting Fort Kochi. At Prems Home stay, good hospitality is a family affair for Mr. Prem, the host of the home. 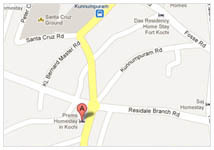 The guests feel at home throughout their stay in Cochin. The rooms are well furnished, and have balconies that open up to give you a wonderful view of the heritage buildings and streets nearby. The attached European style washrooms, amenities as in a hotel, all add to make your stay comfortable, yet affordable. 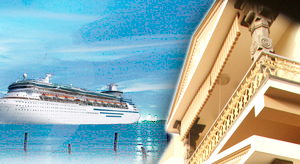 "We had a comfortable stay. The atmosphere here was calm .........."
"Very nice and friendly family, we got lots of useful information .........."
"Thank you a lot for warm hospitality. We had a good stay here. .........."